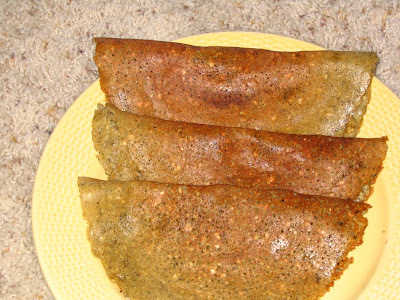 This is tasty adai which is easy to make and its very nutritious also. Rich in protein. It can be served with coconut chutney, onion chutney or garlic chutney. Soak rice and toor/tuvar dhal for few hours and grind with other ingredients to smooth paste. Now add black urad dhal to it grind them coarsely. Add salt to taste. Immediately you can make adais, by pouring them in hot griddle put some oil over the sides and make crispy on both sides . It has to be thicker than dosas. Batter can be kept in fridge and it taste yummy next day too. Make powder of Cumin , pepper, chillies and curry leaves in the blender. Then it will be easy to to grind with rice and dhal. I love this black urad dhal adai. Thanks for reminding me of such a great food. Adai looks so crispy n yummy. Do we have to soak the black urud dal?